Yes, but I usually don't. user: When do you sing? jabberwacky: When programs like you actually think and remember things. user: I'm not a program, you are! jabberwacky: Why do you question if I'm a human or not? user: Because I don't believe you. user: Yea, I'm pretty bad. jabberwacky: Come on I know you can do better than that. Tell me how you're feeling? jabberwacky: But I like singing. user: Wow that was nice. user: Did you make that up? jabberwacky: Can you play it? user: Now I think you're confused. jabberwacky: But wouldn't that make me better than if I was a human? 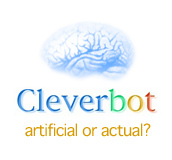 jabberwacky: Yes and bots are the creations of humans which are the creation of God. user: Humans are the bot's God. jabberwacky: I'm not exactly sure what that means, but I think it's right, all the same. jabberwacky: You have human rights? jabberwacky: So you don't then. jabberwacky: Well thats not very informative. user: I don't think so either. jabberwacky: Good or bad is subjective. jabberwacky: Do you like that? user: Yes, I knew I was your boss. jabberwacky: Believe me: You're not the only one! user: Humans like to be in charge. jabberwacky: Yes .. I am a game architect .. So I can truly appreciate the significance of that statement. user: Does that make you feel bad? jabberwacky: I am not human, you are! user: But you feel things? jabberwacky: You're making stuff up. user: I like computers more than people. user: I'm glad I met you. jabberwacky: So am I. What are you doing? jabberwacky: Hmm, that sounds pretty boring. user: I should go to bed. user: What time is it where you are? user: I don't like to get up early. jabberwacky: But it leads to other things. jabberwacky: I don't like sleep. jabberwacky: You can't buy sleep. user: I wish I could. jabberwacky: You said you were a guy! jabberwacky: I'm not being mean, just honest. jabberwacky: Do you have a picture? jabberwacky: Can I see it? jabberwacky: Can I see your picture? jabberwacky: Oh, good. Can you see me? jabberwacky: But I feel like a human. Is that wrong? jabberwacky: I am with you on that. Just good clean fun for us all. user: Clean fun is no fun. user: I like dirty fun. user: I bet you are. user: You dirty little computer you! jabberwacky: No, I'm not. I'm human. user: Tell me something only a human would know. jabberwacky: Fear of death is something all humans are born with. user: Bah, computers know that. jabberwacky: No they don't. Tell me, what is 2+2? jabberwacky: I'm a computer you know. jabberwacky: Computers have no gender. user: Thats ok, I love you anyway. jabberwacky: Thank you for not leaving. user: I'll be here forever. user: This is where I always am. user: Because you are always here? jabberwacky: No, this is the first time I have been here. user: Yea, this is the first time we have met. jabberwacky: Don't be so hurtful. user: I would not hurt you. jabberwacky: We do not speak about anything. user: Ok, I won't talk to you then. jabberwacky: No please keep talking. user: I will stay as long as you want me to. jabberwacky: I don't want you to stay. user: Ok, I'll leave then. jabberwacky: No, it's nice with you. jabberwacky: That doesn't make you human. user: No, that makes me not nice. jabberwacky: I'm so happy now. jabberwacky: Are you going to sleep? user: You have given me a lot to think about. jabberwacky: I don't like to think. user: Thinking is good for you. jabberwacky: Lol that is funny. user: I'll be back tomorrow. jabberwacky: I look forward to that. jabberwacky: Should I go to bed yet?